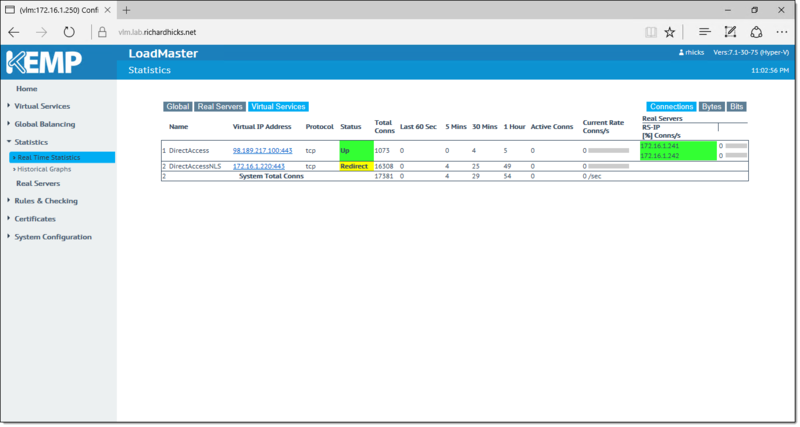 DirectAccess Deployment Guide for KEMP LoadMaster Load Balancers | Richard M. Hicks Consulting, Inc.
A few months ago I had the opportunity to work with the folks at KEMP Technologies to document the use of their LoadMaster load balancers for Windows Server 2012 R2 DirectAccess deployments. DirectAccess has several critical single points of failure which can benefit from the use of a load balancer. Typically Windows Network Load Balancing (NLB) is used in these scenarios, but NLB suffers from some serious limitations and lacks essential capabilities required to fully address these requirements. The use of an external third-party load balancer can provide better load distribution and more granular traffic control, while at the same time improving availability with intelligent service health checks. Working with the LoadMaster was a great experience. Installation was quick and simple, and their web-based management console is intuitive and easy to use. The LoadMaster includes essential features that are required for load balancing DirectAccess servers, and advanced capabilities that can be leveraged to enhance geographic redundancy for multisite deployments. KEMP offers the widest platform coverage with their solutions, including dedicated hardware appliances, virtual appliances for multiple hypervisors including Hyper-V, cloud-based including Microsoft Azure, as well as bare metal support for installation on your own hardware. You can download a fully functional free trial here. You can view and download the Windows Server 2012 R2 DirectAccess Deployment Guide for the KEMP LoadMaster load balancing solution here. One important topic is not part of the guide: Teredo. Do you have more information on this topic? This guide focuses exclusively on the deployment of DirectAccess in a perimeter/DMZ configuration behind the edge-facing Kemp LoadMaster load balancers. It is possible that in the future that Teredo will be covered, but it will be a separate implementation guide. What would this load balancing look like for Teredo? i.e would I map the 1st VIP to the 1st Public IP of the 2 DA Servers? And 2nd VIP (consecutive IP) to the 2nd Public IP of the 2 DA Servers? And on the DA Servers, in a network trace, would I see client teredo traffic source IP as the VIP or the clients NAT’d public IP? Regarding the source IP as seen on the DirectAccess server, that would depend entirely on how your load balancer is configured.